Your liver is the largest and one of the most important internal organs in your body. It serves vital roles, including removing toxins from your blood and converting food to fuel. Fatty liver disease is when your liver accumulates fat. It is reversible and commonly seen in alcoholics, but is also seen in non-alcoholics. Substances in green tea appear to have benefits if you have fatty liver disease. NAFLD is when you develop excess fat in your liver, yet you drink little to no alcohol. It is normal for your liver to contain a small amount of fat, however if 5 to 10 percent of your liver's weight is fat, you are considered to have fatty liver disease. Risk factors include diabetes, high cholesterol and being overweight, according to the American Liver Foundation. However, fatty liver is also seen in people with no risk factors. Non-alcoholic liver disease is considered a non-serious condition. Though it is not normal to have accumulated fat in your liver cells, that alone does not damage your liver. A small number of people with NAFLD develop a more serious fatty liver condition called non-alcoholic steatohepatitis, which causes liver inflammation and damage. Fatty liver disease is a common consequence when you consume excess alcohol. It is one of the earlier consequences of chronic alcohol consumption, but can develop into more severe liver conditions, such as alcohol-induced liver cirrhosis. Cirrhosis is when your liver becomes scarred. This scarring makes it hard for your liver to function optimally, so poor liver function is a common result. The cessation of drinking helps to improve alcoholic fatty liver disease. Green tea is made from green tea leaves and it contains beneficial chemicals. Among them is epigallocatechin-3-gallate, also known as EGCG. It is part of a larger group of compounds called polyphenols, which exert antioxidant effects and can help to protect your cells and tissues from the damage of unstable molecules known as free radicals. Free radicals are atoms with unpaired electrons, which makes them unstable. They go around stealing electrons from healthy cells in an effort to pair with their own electrons, but this damages healthy cells and tissues. Antioxidants find free radicals and pair up with them, which neutralizes them and prevents them from causing damage. A study published in the September 2008 issue of the "Journal of Nutrition" examined the effects of EGCG on fatty liver symptoms in high-fat fed mice. Mice were treated with EGCG for four weeks. The study concluded that EGCG treatment helped to reverse fatty liver disease and helps to reduce inflammation. Another group of mice treated for 16 weeks had even more benefits. The study noted that the long-term treated mice had reduced body weight gain and fat percentage. More research is needed, but it appears green tea has beneficial effects on fatty liver disease and fat metabolism. 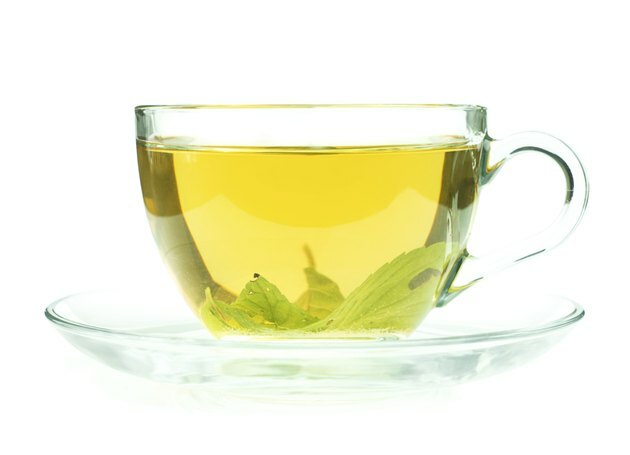 The typical cup of green tea contains 50 mg to 150 mg of polyphenols, according to the University of Maryland Medical Center. Green tea is also available as an extract in liquid and capsules. In absence of definitive human studies, therapeutic dosage information for fatty liver disease is lacking. However, according to the UMMC, you can drink two or three cups daily to get its benefits.